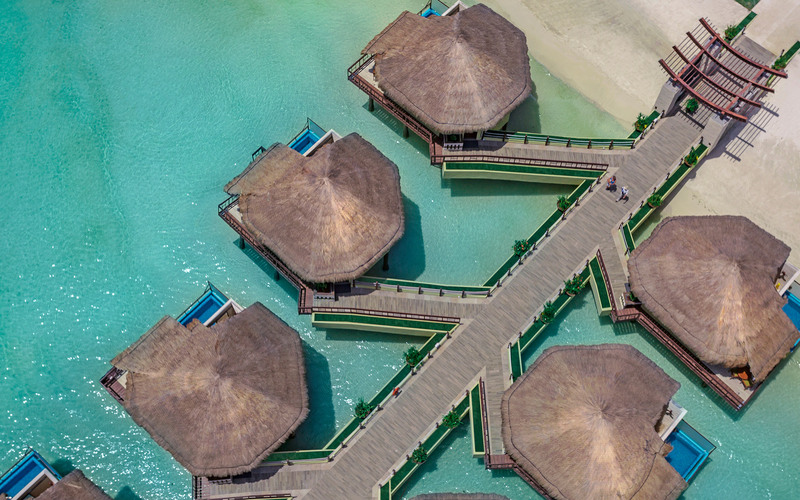 Adults only overwater huts: The follow are overwater bungalows, I would call them as ‘overwater huts’; the thatched roof gives that impression though there may be another inner roof beneath it. Well, these overwater huts or overwater villas that are meant only for adults are part of various types of accommodations provided by the Eldorado Spa Resorts in Mexico’s Riviera Maya, the world’s 4th ranked beautiful resort. 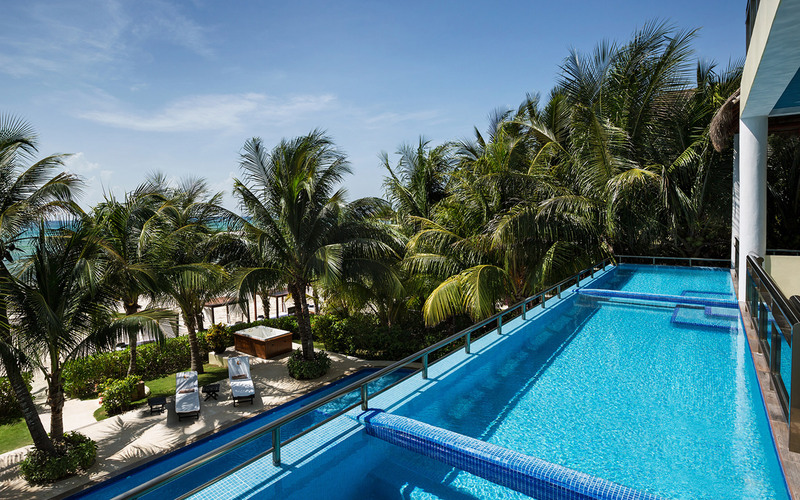 The Riviera Maya requires no introduction to the rich and famous; the bold and beautiful. The entire beach city in Mexico is expensive, the food, the accommodation, the fun, and frolic-all require you to pay without batting an eyelid. You are supposed to be rich there or at least act rich. Location of El Dorado Maroma Adults Only Beach Resort. The glass-bottomed bedroom is giving a panoramic view of the Caribbean Sea. This blog post is a review of this all-inclusive five-star gourmet and spa resort called Eldorado Maroma. I think that spells what sort of this beach resort is, where you get pampered at every minute of your stay. Whatever attention by a butler you have dreamed of thus far will realize at Eldorado Maroma Spa Resort in Riviera Maya, Mexico. 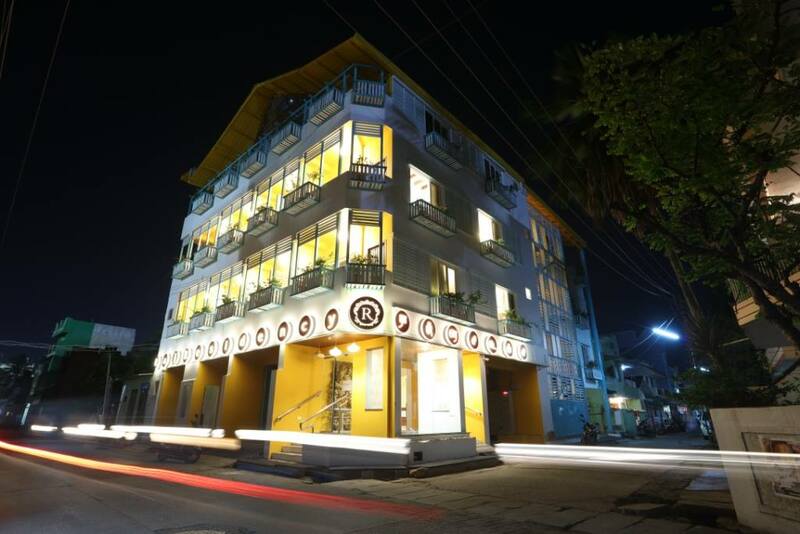 Let us go over what kinds of accommodations are available so that you can decide what suits your dream and book accordingly. 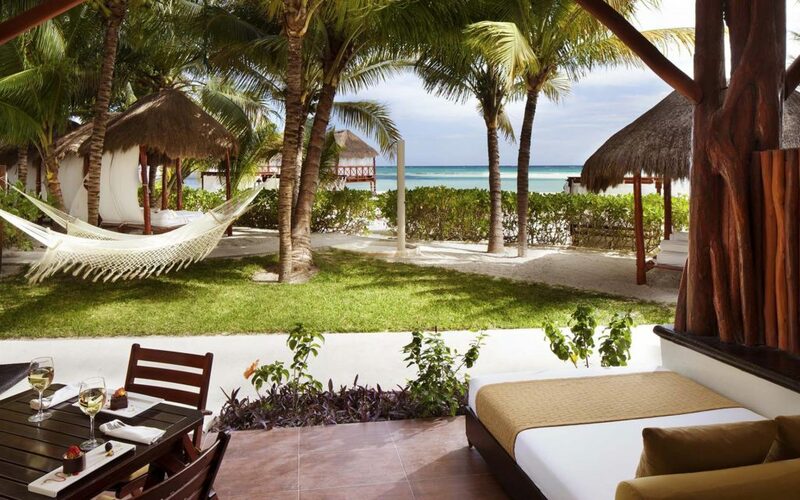 The name of the location is Riviera Maya facing the Caribbean Sea. 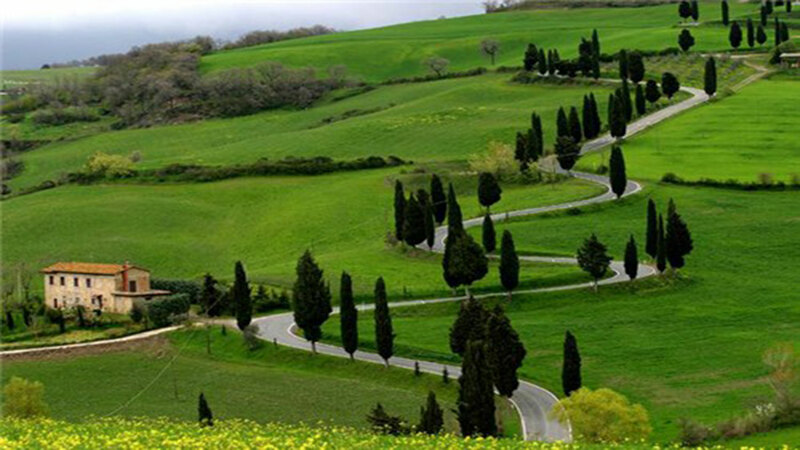 It is part of Mexico’s Yucatán Peninsula situated in the Northeastern part of Mexico. The entire stretch of this Caribbean coastline is scattered with ultra-luxury beach resorts, yoga and health retreats, and spa resorts. 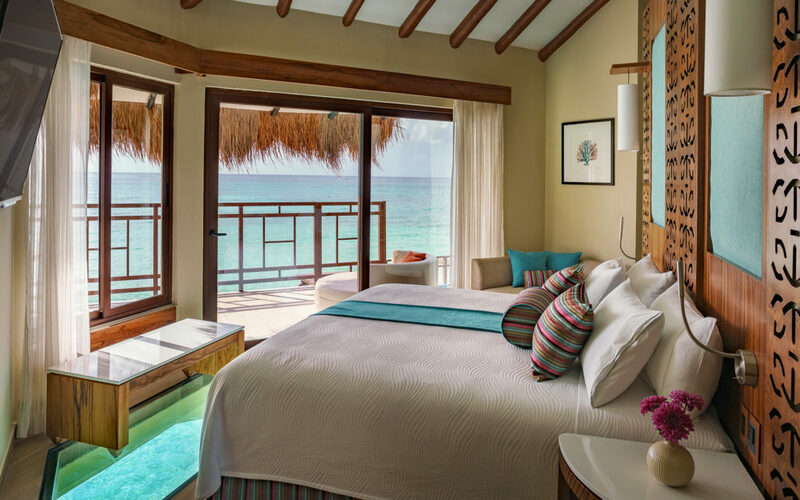 Before you look into other types of suites and bungalows in Eldorado Maroma Spa Resort, let us first visit the “overwater bungalows” that is the subject line of this blog article. The design is creative with free movement as the theme. 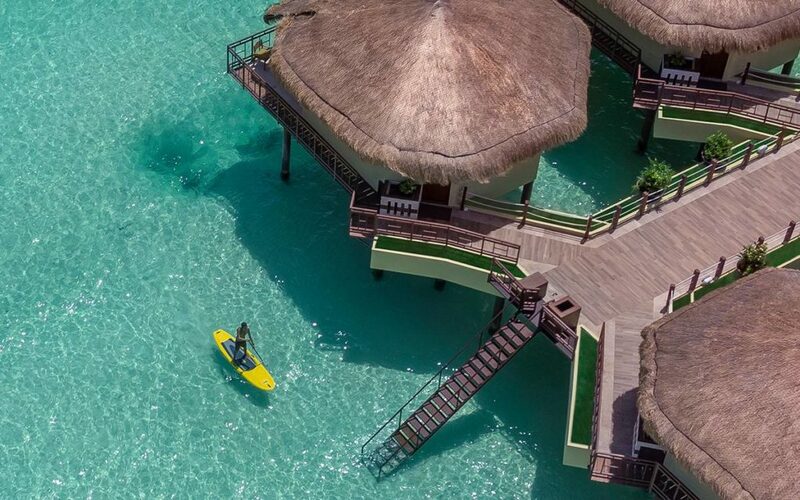 All the overwater bungalows are interconnected through a pier that makes it easy for a group of families who have rented more than one floating hut. Apart from having all of the Caribbean seas to yourself, every overwater hut has a private infinity pool that seems to merge with the Caribbean sea seamlessly. Of course, you can see as far as your eyes can feast on the Caribbean sea without a speck to block your view. The floor of the floating rooms is made of glass so that you know what is beneath your feet. Spend hours watching the myriad marine life that is unaware of someone is looking over them. Every room is fitted with a ladder through which, you can descend to the sea. A sprawling wooden deck to watch the sunrise. Take a fresh-water shower from the outdoor shower cubicle. This freedom cannot be enjoyed except in these types of over-sea bungalows. Inside your floating cottage, there is a Jacuzzi. You are allocated a butler exclusive for you. I am sure this is one aspect of your dream. Stretch your laziness to the maximum. There is a dining area inside the cottage. A fridge stocked with drinks and beverages. Make your Mexican coffee with the help of a coffee maker. An exclusive restaurant meant only for the overwater bungalow guests. Apart from a range of wines and liquors, you are treated to top Mexican fare such as the typical Mexican pasta that is all Spanish in taste. All the El Dorado Villas are of a duplex type. 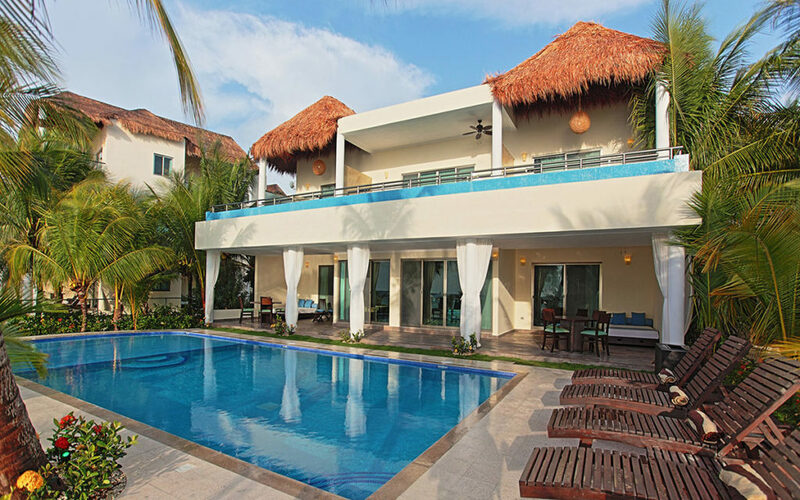 An entire family or two can stay in one villa as there are as many as five bedrooms! There is a butler on call, exclusively for you to attend to your needs and whims. You are given separate access to the Caribbean beach where beach beds would be ready for you laid out neatly on a chaise. Look at the bedroom inside the Eldorado Maroma villa. 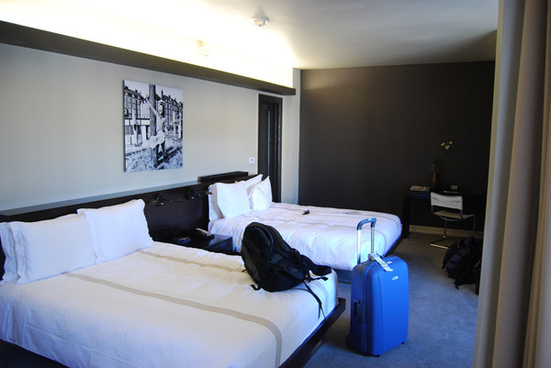 Aesthetically decorated and painted, the beds look massive and super soft-eh? Apart from a pool at the ground level, there is one more on the first floor! A private Jacuzzi and that too in your room is indeed a luxury. It gives a sense of freedom to walk into the Jacuzzi as and when you like and however you are dressed. These minor freedoms are called real luxuries, and they matter much to us right? Also, this Junior Jacuzzi suite is located very close to the main swimming pool and its adjoining swim-up bar. 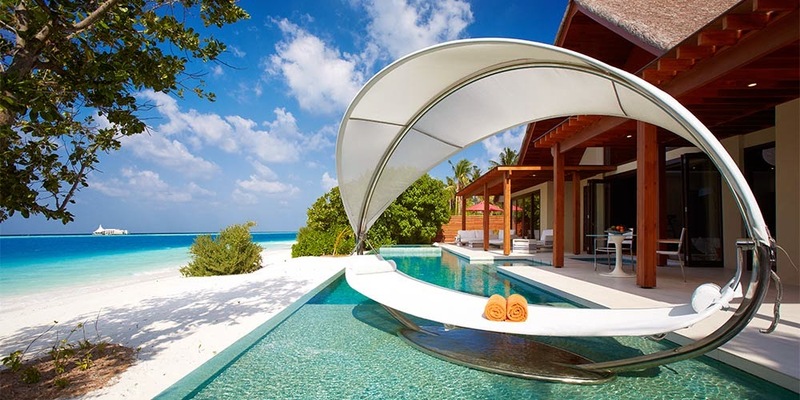 Oh, I think you will feel like you have just moved into a paradise. I am sure this beachfront suite will be up in a premium during winter when the temperature drops to 20 deg and you would want the sun on your back (and front too) as much as possible. 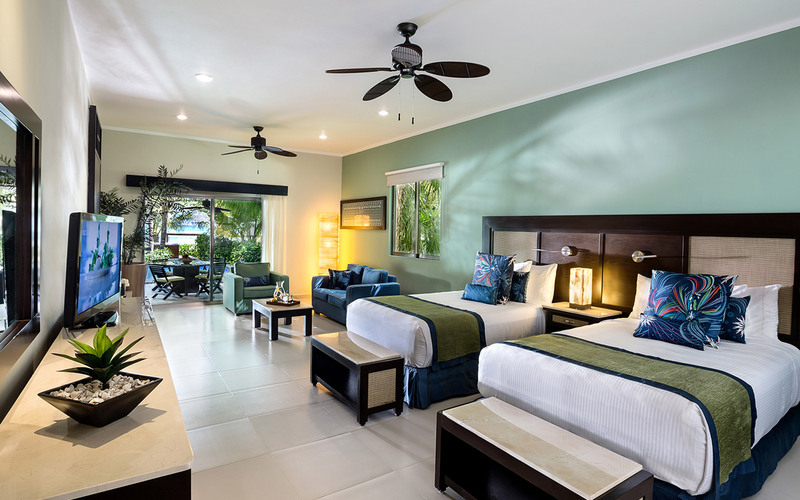 Your room that faces the Caribbean Ocean and is stone’s throw away from the beach; you can soak up in the solar-powered warmth anytime you wish. In addition to the proximity to the beach, your bedroom opens on to a large terrace for ocean gazing. In whichever you resort you stay, be it a beachfront resort or a resort facing a canyon, or a suite in a ski resort, there would be something special for the honeymoon couples-right? 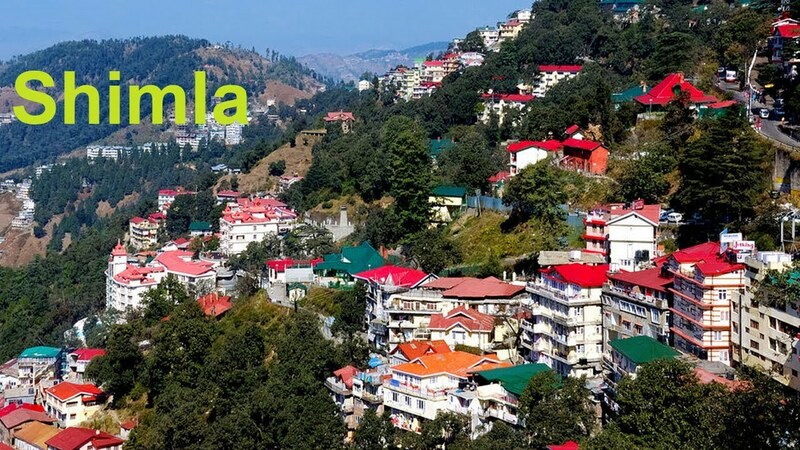 Wither it is a first honeymoon or second; honeymooners are always treated specially, mainly to lure them into celebrating a honeymoon every year and into enticing to them to return the same resort. The image of the honeymoon suite above spells it all. A villa just abutting the beach is indeed a special one. Is privacy the most deemed luxury for honeymooners-eh? 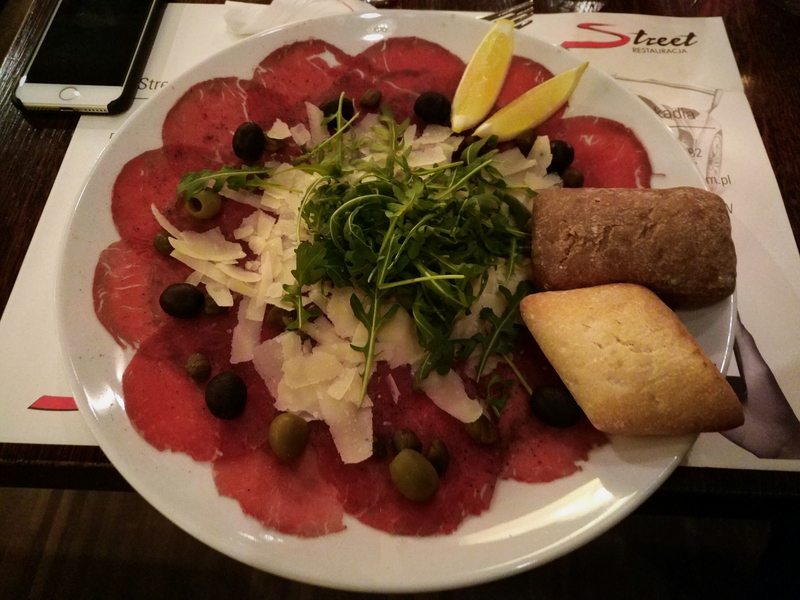 Let us now move onto another important aspect of your vacation in anywhere you choose to stay-the food. Food and drinks at Eldorado Maroma Spa Resort. 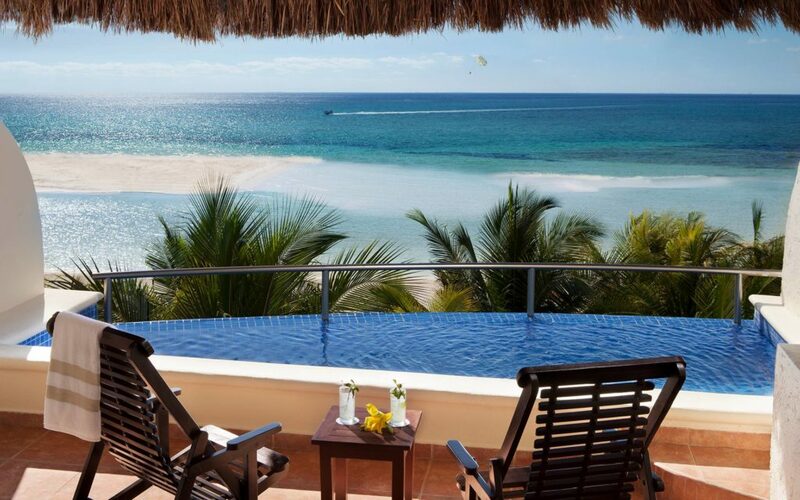 After reading below about the restaurants and bars in Eldorado Maroma Spa Resort, you will nod your head acknowledging the reason for this Mexican resort that is voted as one of the top ten ultra-luxury beach resorts in the world. I think you would have already acknowledged it after looking at the various types of accommodations including the adults-only floating villas right on the Caribbean Ocean water. There are as many as 5 bars with a different theme and six restaurants that offer different cuisine Asian cuisine which is worlds apart from Mexico. You are served a mixture of Mexican and Caribbean cuisine. I guess the difference between the two kitchens will be minor and ignorable. Sounds like a Japanese name but I suppose you don’t get to eat an all-Japanese fare. Your food will contain flavors of Chinese, Korean, and Vietnamese. Shall we call it ‘Inca’ Cuisine’? I guess not as after all that civilization is quite ancient. I don’t think they would have passed on their types of food preparation for their offspring generation. Maybe the Eldorado Maroma resort would serve Amaranthus, ceviche and several tubers that look like a potato. Modern Peruvian cuisine is said to be a mixture of Mexican, Asian, and Japanese. What fusion! It is interesting, and I think I will write an exclusive article about Peruvian cuisine and drinks. I saw people reach for mocktails and martinis in a swim-up bar. Just after a couple of laps, the swimmers could not resist the urge to grab for a drink while still staying on the water, leaning on the pool’s edges. Familiar sight-right? Chakay must be a Mexican or Peruvian name and this bar is also a poolside bar. I wonder why there are more bars by the poolside than on a terrace or in air-conditioned rooms! Mio is one more swim-up far facing the Caribbean Ocean. The bartender takes pride in demonstrating his drink mixing skills. Maybe you can pick a trick or two. This bar giving you a panoramic view of the Caribbean ocean is located on the fourth floor. I think this bar would receive the least patronage because it is a self-serve bar. I am of the firm opinion that the guest would like their drinks served at their tables with a bow and a smile of course. 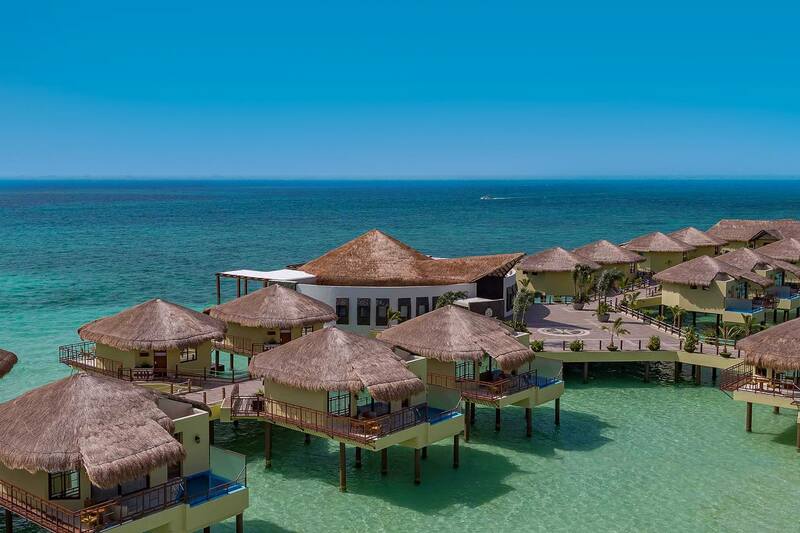 This winds up an in-depth review of Eldorado Maroma Spa Resort’s various accommodations including the overwater bungalows meant for adults only, their 6 different restaurants serving 6 different cuisines and 5 bars located at various places inside this Mexican beach resort. It can be an expensive stay all right here but after reading through, don’t you think it is worth it? Hope, you enjoyed this informative article about “Adults only overwater huts”. Please comment, share and vote for it.